On the 25th November 1928 Adelaide’s premier nightspot, the Palais de Danse mysteriously started taking on water and then sadly sunk to the bottom of the River Torrens. After a long 89 years the Riverside Palais has been revived for the 2017 Adelaide Festival. For the duration of the Adelaide Festival, the Palais has been recreated on the banks of the Torrens, in Elder Park, to host a range of events such as breakfasts, concerts, dance evenings, and also a series of Riverbank Palais Long Lunches hosted by local celebrity chefs. This year I have been lucky enough to be in Adelaide for the duration of the Adelaide festival, and for my birthday I received tickets to the very first Riverbank Palais Long Lunch. This first long lunch was hosted by the South Australian chef, Cath Kerry. In 1958, at the age of 11, Cath migrated to Australia, and influenced by her French background, Cath was responsible for an explosion of nouvelle cuisine in Adelaide during the early 1980s. Paying tribute to Phillip Searle, Gabriel Gaté, Michael Symons and Jennifer Hillier, Cath created a delicious menu for the first Riverbank Palais Long Lunch, including some of their iconic dishes from this era. I arrived in Elder Park just before 11:30 and joined the small crowd of people waiting to board the Riverbank Palais. About 5 minutes later we were invited onboard for the Riverbank Palais Long Lunch. We were welcomed onboard with a welcome cocktail, a Penfold’s Claret Cup, which was absolutely delicious, and we invited to enjoy it at the bar area, or head upstairs to the terrace in the sun. Anchovy Matches and Tofu with black pepper & cucumber were also served on the terrace, and in the bar area. At midday we were asked to head through to the dining area and take a seat, everybody did this reasonably fast, taking into consideration there were almost 250 people attending the lunch. Apart from the welcome cocktail all other drinks were not included with the lunch, so you needed to purchase your own drinks at the bar. The lunch was served in sharing platters for between 6-10 people, and with only one dish being served at a time, so the complete lunch menu took over three hours to complete. The food was an eclectic mix of nouvelle cuisine from the early 80s, which was when Cath’s career exploded onto Adelaide’s culinary scene. From an unusual, but delightful watermelon “croûton” with tomato & deep fried herbs to classic lamb fillets with bagna cauda & parsley salad with spiced, pickled beetroot and Fennel gratin. A copy of the full menu can be seen at the end of my review. During the meal Cath did take centre stage for a couple of speeches, and also passed through the dining area to meet some of the guests. The group of people sat to my right knew Cath from a long time ago and got talking to her, so I took this opportunity to ask her to autograph my menu. This is something I’ve never done before, but I thought it would be a nice memento from my long lunch experience. More often that not with experiences like these, you find that the drink prices at the bar can be horrendously expensive, however with the Riverbank Palais Long Lunch this was not the case. Penfold’s Wines from the Barossa was the drinks partner for the long lunch, and the entry level Wines on their list (which were actually middle of the road bottles) were priced at $40 a bottle, so no more than you would pay in a restaurant. Premium spirits such as Tanqueray were also available, and again they were very reasonably priced. Cath Kerry’s Riverbank Palais Long Lunch was an extremely enjoyable experience, and her food was to die for. Had I any more weekends free during the Adelaide Festival I would have loved to have attended another of the long lunches, and at $150pp it offers exceptional value. 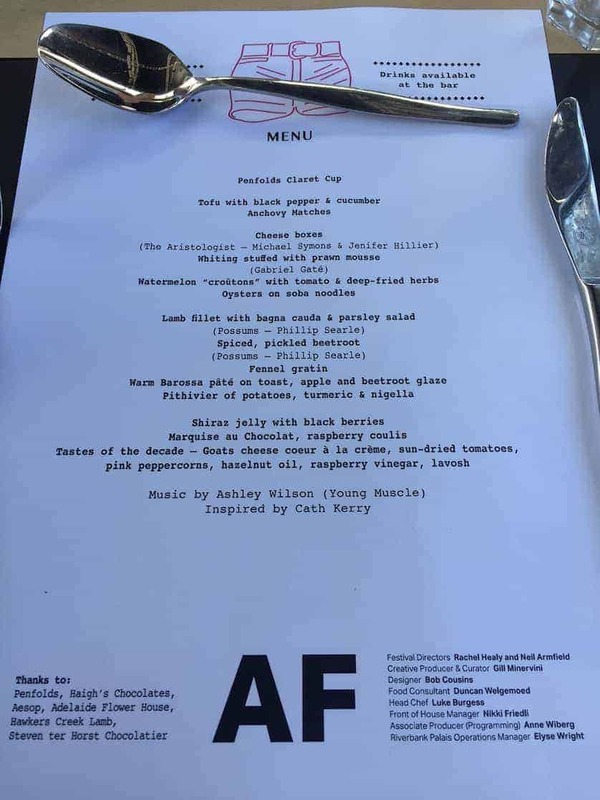 Other chefs which have hosted long lunches during the 2017 Adelaide Festival are; Mark Best, Christine Manfield, Michael Ryan, Cheong Liew and Karl Firla. That lunch menu looks amazing. Wow. Would need to be a long lunch to get through all those courses. It was delicious, we definitely needed three hours to get through it all!